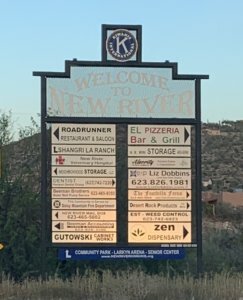 Find real estate for sale in New River AZ and surrounding areas by selecting from our results below, or by entering your search criteria. New River / Anthem median real estate price is $327,219, which is more expensive than 73.6% of the neighborhoods in Arizona and 69.5% of the neighborhoods in the U.S. The average rental price in New River / Anthem is currently $2,005, based on NeighborhoodScout’s exclusive analysis. 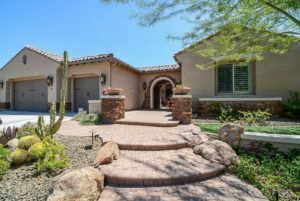 The average rental cost in this neighborhood is higher than 89.9% of the neighborhoods in Arizona. New River / Anthem is a rural neighborhood (based on population density) located in Phoenix, Arizona. New River / Anthem real estate is primarily made up of medium sized (three or four bedroom) to large (four, five or more bedroom) single-family homes and mobile homes. Most of the residential real estate is owner occupied. Many of the residences in the New River / Anthem neighborhood are newer, built in 2000 or more recently. A number of residences were also built between 1970 and 1999. Home and apartment vacancy rates are 10.9% in New River / Anthem. NeighborhoodScout analysis shows that this rate is lower than 40.1% of the neighborhoods in the nation, approximately near the middle range for vacancies. In the New River / Anthem neighborhood, many people’s commute means walking from the bedroom to the home office. NeighborhoodScout’s analysis found that 16.7% of residents worked from home. This may not seem like a large number, but Scout’s research shows that this is a higher percentage of people working from home than 98.7% of the neighborhoods in America. Often people who work from home are engaged in the creative or technological economy, such as is found in areas around Boston, and in Silicon Valley. Other times, people may be engaged in other businesses like trading stocks from home, or running a small beauty salon. Homes built from 2000 through today make up a higher proportion of the New River / Anthem neighborhood’s real estate landscape than 97.5% of the neighborhoods in America. When you are driving around this neighborhood, you’ll notice right away that it is one of the newest built of any, with the smell of fresh paint, and the look of young landscaping nearly everywhere you look. In fact, 64.0% of the residential real estate here is classified as newer. Did you know that the New River / Anthem neighborhood has more Yugoslav and Czechoslovakian ancestry people living in it than nearly any neighborhood in America? It’s true! In fact, 3.3% of this neighborhood’s residents have Yugoslav ancestry and 0.6% have Czechoslovakian ancestry. New River / Anthem is also pretty special linguistically. Significantly, 1.5% of its residents five years old and above primarily speak Native American languages at home. While this may seem like a small percentage, it is higher than 98.6% of the neighborhoods in America. The neighbors in the New River / Anthem neighborhood in Phoenix are upper-middle income, making it an above average income neighborhood. NeighborhoodScout’s exclusive analysis reveals that this neighborhood has a higher income than 74.3% of the neighborhoods in America. In addition, 1.9% of the children seventeen and under living in this neighborhood are living below the federal poverty line, which is a lower rate of childhood poverty than is found in 82.6% of America’s neighborhoods. In the New River/Anthem neighborhood, 48.3% of the working population is employed in executive, management, and professional occupations. The second most important occupational group in this neighborhood is sales and service jobs, from major sales accounts, to working in fast food restaurants, with 22.6% of the residents employed. Other residents here are employed in manufacturing and laborer occupations (18.3%), and 10.8% in clerical, assistant, and tech support occupations. The languages spoken by people in this neighborhood are diverse. These are tabulated as the languages people preferentially speak when they are at home with their families. The most common language spoken in the New River / Anthem neighborhood is English, spoken by 82.1% of households. Other important languages spoken here include Spanish and Polish. In the New River / Anthem neighborhood in Phoenix, AZ, residents most commonly identify their ethnicity or ancestry as German (13.2%). There are also a number of people of Irish ancestry (12.7%), and residents who report Mexican roots (12.1%), and some of the residents are also of English ancestry (11.4%), along with some French ancestry residents (6.2%), among others. In addition, 10.0% of the residents of this neighborhood were born in another country. Even if your neighborhood is walkable, you may still have to drive to your place of work. Some neighborhoods are located where many can get to work in just a few minutes, while others are located such that most residents have a long and arduous commute. The greatest number of commuters in New River / Anthem neighborhood spend between 30 and 45 minutes commuting one-way to work (27.1% of working residents), which is at or a bit above the average length of a commute across all U.S. neighborhoods. Here most residents (90.2%) drive alone in a private automobile to get to work. In addition, quite a number also carpool with coworkers, friends, or neighbors to get to work (9.2%) . In a neighborhood like this, as in most of the nation, many residents find owning a car useful for getting to work.